Feigenbaum Dental strives to create beautiful smiles with a gentle touch, which is why we provide our patients with the most advanced dental technology. To ensure our patients receive the exceptional dentistry they deserve, we offer soft tissue laser dentistry in Creve Coeur. A soft tissue laser is a revolutionary dental technology that makes common dental procedures and treatments less invasive while providing more accuracy. You will benefit from less discomfort, a quicker recovery, and less risks. We can use the soft tissue laser in combination with several dental services, including periodontal therapy. A soft tissue laser will replace the need for a scalpel when used for specific dental procedures. The specialized dental instrument uses an intense beam of narrow light energy. As the laser meets the tissue, a reaction occurs, allowing the laser to remove and recontour soft tissue. With the use of the laser, we can specifically target areas to be treated. As a result, you will enjoy more accurate and precise results. There are minimal risk factors for damage or trauma to surrounding tissues. In addition, the laser cauterizes the area that is treated. You will benefit from less risk for infection and less bleeding after the procedure. Overall, treatment with laser dentistry is more comfortable and enhances healing time. Laser dentistry provides a safe and effective alternative to other more invasive dental instruments. Laser dentistry is versatile, so it can be used for several purposes. However, laser dentistry is most beneficial to those with periodontal disease in our practice. Lasers are now commonly used to treat periodontal disease by removing inflamed and infected tissue. The laser also allows for the gum line to be recontoured to enhance the aesthetics of your smile when living with gum disease. After an area has been treated with the laser, there is a decrease in bacteria found in the gum tissue. This aids the recovery process while reducing the progression of the infection. In the 1990s, laser dentistry became available; however, was not typically found in dental practices. Today, laser dentistry holds a commonplace in modern dental practices because the treatment is safe and effective when performed by a specially trained dentist. Supported by more than 30 years of experience, Feigenbaum Dental offers the experience and credentials needed to perform laser dentistry procedures. 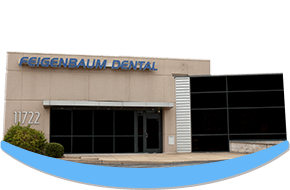 Feigenbaum Dental proudly provides patients with state-of-the-art dental technology to provide superior dental care. As a laser dentist, we will treat soft tissues using a minimally invasive treatment. With your comfort the core of our care, we look forward to enhancing your comfort and oral health with laser dentistry. If you are ready to benefit from the best dentistry has to offer, contact Feigenbaum Dental to learn more about how laser dentistry can help you.